We’d love your help. Let us know what’s wrong with this preview of Betrayed by Jennifer Rush. After leaving Anna, Sam, Cas, and Nick behind, Trev is on his own and under the watchful eye of the Branch once more. But where do Trev's loyalties really lie? Riley, Trev's overseer, is determined to find out. On Riley's command, Trev sets off on a mission to a small Wisconsin suburb. His order: locate and kill a seemingly innocent teen named Charlie. Trev soon learns, th After leaving Anna, Sam, Cas, and Nick behind, Trev is on his own and under the watchful eye of the Branch once more. But where do Trev's loyalties really lie? Riley, Trev's overseer, is determined to find out. On Riley's command, Trev sets off on a mission to a small Wisconsin suburb. His order: locate and kill a seemingly innocent teen named Charlie. Trev soon learns, though, not everything is as it seems in this quiet town--most of all Charlie. Find out what Trev's been up to behind the scenes in this Altered Saga original short story. Good but short. Really short. It ended at page 30 of the advertised 59. Leído para el 2015 Reading Challenge #27. Un libro que puedas terminar en un día. Hace rato que leí Altered así que ni recuerdo si es bueno o no (tendría que releerlo) pero si recuerdo que Trev era mi chico favorito. Esta fue una lectura entretenida (y rapida) empieza de una manera y después ¡BOOM! giro de 360°. Me gusta Charlie y espero que los dos estén juntos en Erased y que no se mueran. PD: God, no soporto las portadas ¿qué necesidad de poner siempre a chicos sin remera? I only found out that this book was a thing yesterday at like eleven. And then I preordered it. And then I read it in an hour. And my HEART HURTS. Why must you do this to me, Rush? Poor Trev, I just want him to be happy. I like the hopeful ending, and the promises it makes, but it was awful to see all the dislike he harbours for himself, and how he doesn't think he's deserving of forgiveness. I could easily read seven more novellas about Trev, to be honest. I want to see him get the happiness and the forgiveness he deserves. OMG, WHAT IS THIS? What is this?? A freaking Trev novella? Yes, please. With a slice of hotness, thank you. As always... I love everything about this series! Well maybe everything except the covers. Seriously they all have to be a shirtless guy? Can't we have a bit more originality? Maybe that's what sells books. I definitely could use more Trev novellas! Trev! I'm glad this novella was written because it's great to see some stuff from Trev's point of view. I liked getting inside his head a bit. But, it was kind of a tease! I would LOVE to see what happens next. I'd love a fuller novella that tells everything that happened with him from the time he turned on his unit until when he met up with Nick in Reborn. So, if you are fan of Trev and/or the series, you're going to like this novella, but be prepared for it to leave you wanting more than we go Trev! I'm glad this novella was written because it's great to see some stuff from Trev's point of view. I liked getting inside his head a bit. But, it was kind of a tease! I would LOVE to see what happens next. I'd love a fuller novella that tells everything that happened with him from the time he turned on his unit until when he met up with Nick in Reborn. Betrayed is a short novella from Trev's point of view after the events of Altered. I fell in love with Trev during Altered, and even though he made some bad choices, I always rooted for him and I do hope he gets redemption - more than anyone else, he deserves it. Trev's wise, he has interesting train of thought, he's thoughtful but also full of action. The best thing about him is that he doesn't act without thinking every aspect first, and he's the type to observe others, signs and things. It ma Betrayed is a short novella from Trev's point of view after the events of Altered. I fell in love with Trev during Altered, and even though he made some bad choices, I always rooted for him and I do hope he gets redemption - more than anyone else, he deserves it. Trev's wise, he has interesting train of thought, he's thoughtful but also full of action. The best thing about him is that he doesn't act without thinking every aspect first, and he's the type to observe others, signs and things. It makes him cautious, but that's also why he survives. Betrayed confirms this, and adds more to his character. I can't say too much about the story itself, but I really liked it and I hope that we get more of the new character in books to follow. My poor baby, Trev deserves so much better. One complaint... it was too short! I need more Trav. This is seriously one of the best novella I have read so far. Ahora comenzare a leer Erased. "En una época de engaño universal, decir la verdad es un acto revolucionario". Ya quiero saber de Trev y Charlie en el tercer libro. Everyone has two lives. The second begins when you realize you only have one. WHAT WAS THAT ENDING!?! I seriously need more! I hope Trev gets a full length book. No se muy bien cómo hacer esta reseña. Siempre me pasa cuando tengo sentimientos encontrados. Trev no me acaba de caer bien. Pero aún así saber porque hizo lo que hizo y como lo soluciona o intenta solucionar me ha parecido genial. Otro punto de vista . After Trev helps his unit escape, he knows exactly which side he is on, even though he knows there's hardly a way back into that circle. I always knew he was one of the good guys! =) And because Riley isn't as stupid as I wish he was, he has his suspicions. Trev, being as smart and adaptable as they come, knows he has to find a way to make it work as a sabotaging agent inside the Branch without getting himself killed. It's the perfect place for him to be, if you ask me. If someone can pull it of After Trev helps his unit escape, he knows exactly which side he is on, even though he knows there's hardly a way back into that circle. I always knew he was one of the good guys! =) And because Riley isn't as stupid as I wish he was, he has his suspicions. Trev, being as smart and adaptable as they come, knows he has to find a way to make it work as a sabotaging agent inside the Branch without getting himself killed. It's the perfect place for him to be, if you ask me. If someone can pull it off, it's Trev. Coz let's face it, the man is dangerously cunning, and if it weren't for his good heart, he'd be exactly the sort of killing machine the Branch wants. It's a good thing Sura's undercover group is thinking he could be one of the good ones, too. Thus, they have their hands in the assignment to test Trev's loyalties. And what a sweet test she was! I liked all about Charlie, no need to go into details. She's the prefect match for Trev, both sweet and ballsie, not what you expect at first glance, and I could imagine they'd become more than just partners in crime later on. Which can only be good for Trev's sanity. In the short novella "Betrayed" the story revolves around Trev Harper who betrayed his friends, but then helped them break free from the farmhouse laboratory. Under torture he continues to validate his innocence in his friends escape, but the Branch is about to test his loyalty, ordering him to kill an innocent student in Wisconsin. In a plot that's focused on Trev Harper's need to win back the respect, trust and friendship of Sam, Anna, Cas and Nick, he agrees to a mission that tests not only h In the short novella "Betrayed" the story revolves around Trev Harper who betrayed his friends, but then helped them break free from the farmhouse laboratory. Under torture he continues to validate his innocence in his friends escape, but the Branch is about to test his loyalty, ordering him to kill an innocent student in Wisconsin. In a plot that's focused on Trev Harper's need to win back the respect, trust and friendship of Sam, Anna, Cas and Nick, he agrees to a mission that tests not only his resolve but also his moral integrity. The story is fast-paced with twists that captivate the reader. Skilfully Jennifer Rush weaves a plot that gives insight into Trev's determination and ingenuity after meeting Charlie the bright and innocent high school student he has to track and kill. Yet even in this novella Jennifer Rush develops a plot that vibrates with drama and energy. "Betrayed" gives you insight into a fascinating and likeable character who made a bad decision that cost him the respect of his friends. I liked Trev Harper with all his flaws and strengths and hope to see more of him and the "Turncoats" , the resistance organization in the next novel. I loved this novella, but I think that Jennifer Rush got the numbering of her books wrong and I recommend reading it the way that I did. If you read Forged first, it makes no sense and ruins the plot twists and if you read Betrayed (#1.5) before Erased (#2), you view Trev differently than if you go straight from Altered (#1) to Erased (#2). 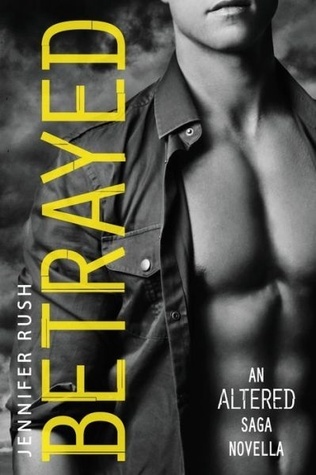 Going from Altered (#1) to Betrayed (#1.5) and then Erased (#2) cheapens Trev's involvement in Era I loved this novella, but I think that Jennifer Rush got the numbering of her books wrong and I recommend reading it the way that I did. If you read Forged first, it makes no sense and ruins the plot twists and if you read Betrayed (#1.5) before Erased (#2), you view Trev differently than if you go straight from Altered (#1) to Erased (#2). Going from Altered (#1) to Betrayed (#1.5) and then Erased (#2) cheapens Trev's involvement in Erased (#2). In Betrayed we get an inside scoop on Trev. Just like the other three boys, Trev is a complicated character. He betrays his friends for his own gains, but we could see that he feels guilty about the events that happened in Altered. Throughout the novella he wishes he could go back to Anna, Sam, Cas, and Nick but we know that's not going to happen as the boys made it clear at the end of book 1 that if they find Trev, the consequences aren't great. Trev wasn't my favorite Altered boy, but I like h In Betrayed we get an inside scoop on Trev. Just like the other three boys, Trev is a complicated character. He betrays his friends for his own gains, but we could see that he feels guilty about the events that happened in Altered. Throughout the novella he wishes he could go back to Anna, Sam, Cas, and Nick but we know that's not going to happen as the boys made it clear at the end of book 1 that if they find Trev, the consequences aren't great. Trev wasn't my favorite Altered boy, but I like how he sought answers in the quotes he spouted to Anna. In this short novella, he is on a mission to kill an innocent girl name Charlie. While he knows what he did in Altered is wrong, he didn't kill. However, once he finds out Charlie's identity, he knows that he can't kill anyone that 1) matters and 2) innocent people that don't know what's going on. A very simple story, but actually helped to rekindle my interest in this series. We follow Trev as he works to become a good little Branch soldier again- all with the aim to become the best mole possible for his unit, his family. He feels deep guilt about his betrayal of them even though he was merely a puppet in the whole thing. It was Helen Keller who said, '"Alone we can do so little; together we can do so much." And I had never felt as alone as I did now. Like an anchor cut from its ship, s A very simple story, but actually helped to rekindle my interest in this series. We follow Trev as he works to become a good little Branch soldier again- all with the aim to become the best mole possible for his unit, his family. He feels deep guilt about his betrayal of them even though he was merely a puppet in the whole thing. It was Helen Keller who said, '"Alone we can do so little; together we can do so much." And I had never felt as alone as I did now. Like an anchor cut from its ship, sitting on the bottom of some dark ocean floor. I hadn't realized it, when I turned Anna and the other over to the Branch, just how much better I was when I was with them. Un libro desde el punto de vista de Trev. Pero como es una precuela, sólo tiene como 30 páginas. NECESITO MÁS LIBROS DESDE EL PUNTO DE VISTA DE LOS CHICOS. Él de verdad quiere el perdón de ellos. Y con este libro me di cuenta que es TOTALMENTE justificada su manera de actuar. Es imposible no enamorarse de cualquiera de estos niños. Una chi Un libro desde el punto de vista de Trev. Pero como es una precuela, sólo tiene como 30 páginas. 3.5 stars. Trev has a lot of making up to do and the way to it is not gonna be easy. He has to redeem his self amongst the Branch, to prove his loyalty and his worth. When you are an avid book reader, sometimes you tend to get ahead of the book itself. Your thoughts linger a bit to what might happen next. I admit I felt this when it was revealed that Marie and Charlie are "double agents" so to speak. I thought that was just another test for Trev, after all, there is no one safe enough to trust at 3.5 stars. Trev has a lot of making up to do and the way to it is not gonna be easy. He has to redeem his self amongst the Branch, to prove his loyalty and his worth. I really enjoyed reading this short novella about Trev! After he betrayed Anna and the gang, I didn't trust him, of course, but I really loved his character and while I didn't trust him, I still couldn't believe that 'my Trev' is a traitor, and knowing The Branch, I had a feeling something is up... as far as I remember, in the 2nd book I read last year, I started to trust him a little, because he helped Anna, but it was still here-and-there and now after reading this novella. I can say that I tru I really enjoyed reading this short novella about Trev! After he betrayed Anna and the gang, I didn't trust him, of course, but I really loved his character and while I didn't trust him, I still couldn't believe that 'my Trev' is a traitor, and knowing The Branch, I had a feeling something is up... as far as I remember, in the 2nd book I read last year, I started to trust him a little, because he helped Anna, but it was still here-and-there and now after reading this novella. I can say that I trust him. It threw me and devastated me when Trevor betrayed the group. I'm so glad to read his perspective and know the guilt he feels for doing it. The novella was too short because I just can't get enough. I love Trev, his deep thoughts and intellect makes him eve I love this series!